"Joey's ribs and sauces were award winning in Southern California, so we are more than excited to bring that quality and taste to the Scottsdale area," says Cristina Maggiore. In the past two weeks Hogs N’ Hops has proven themselves to be the BBQ answer foodies have been craving. Saturday, April 18, 2015 brings the grand opening to the Scottsdale location. The event will have a live DJ, prizes, and plenty of food and drink specials. 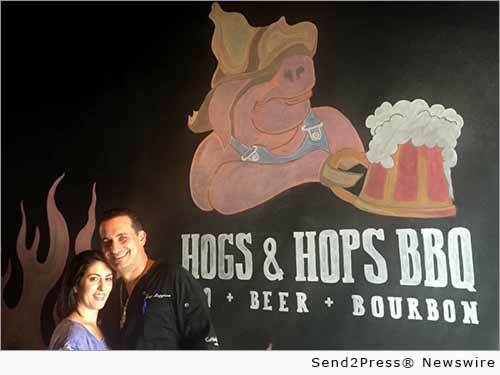 The grand opening of Hogs N’ Hops BBQ will be taking place this Thursday, April 16 at their new location at the Shops at Gainey Village, 8777 N. Scottsdale Rd., Scottsdale AZ 85253. For more information, visit: http://hogsnhopsbbq.com/. Original Keywords: traditional style BBQ, barbecue concept, Shops at Gainey Village Hogs N Hops BBQ Scottsdale Arizona PHOENIX, Ariz.
Alternate Headline: Hogs N’ Hops BBQ announce Grand Opening of New Barbeque Joint in Scottsdale, Ariz.
REFERENCES: Arizona Business News, traditional style BBQ, barbecue concept, Shops at Gainey Village Hogs N Hops BBQ Scottsdale Arizona PHOENIX, Ariz.